Increased concentrations of greenhouse gases, from the burning of fossil fuels, slows the loss of heat from Earth's atmosphere to space. This creates an imbalance between incoming solar energy and outgoing heat. The Earth will continue to warm until the balance is restored. Because this planetary heat imbalance is tiny compared to the energy coming in from the sun, and the heat being radiated back out to space, it is too small to be measured directly by satellites. Earlier attempts to quantify this planetary heat imbalance were made in Hansen (2005) and Trenberth (2009) using earlier climate model-based estimates. Hansen (2005) had this planetary imbalance at 0.85 (±0.15) watts per square meter, and Trenberth 0.9 (±0.5) W/m2, in the earlier part of this century. An apparent mismatch between the modeled estimate and the heat that could be accounted for on Earth, led to well-known climate scientist, Kevin Trenberth to lament that it was a travesty. Trenberth was, of course, referring to the inadequate state of global observations, such as the sparsely sampled deep ocean among other things, but his comment was predictably distorted by misinformers and spawned a fake-skeptic climate myth of its own. Loeb (2012) takes an updated look at the issue and finds that, using observations rather than modeled estimates, the Earth's energy imbalance is consistent with heat building up with the Earth system. They have this imbalance at 0.5 (±0.43) W/m2, much smaller than previous estimates, but the error margins are huge. Not unexpectedly the authors confirmed that heat is continuing to build up in the sub-surface ocean, which agrees with other recent studies on ocean heat. The persistent energy imbalance measured by this study is essentially future global warming, or "warming in the pipeline". It puts paid to wishful thinking-based claims that global warming has halted. Figure 1 - typical dive cycle of the ARGO submersible float system - the most detailed set of ocean heat observations yet obtained. Image from UK Met Office. Earth's energy budget is determined by measuring how much energy comes into the Earth system from the sun, how much is lost to space as heat, and accounting for the remainder on Earth. Very little of this Earthbound energy goes into warming the atmosphere and land because they have a limited capacity to store heat. Likewise the energy required to melt ice is comparatively small. The oceans, however, cover over 70% of the Earth's surface, are dark-coloured (meaning they absorb sunlight readily) and, due to their enormous heat capacity compared to that of the atmosphere and land, store over 90% of the excess energy from global warming. Quite obviously then, accurate measurements of ocean warming are crucial to balancing Earth's energy budget. 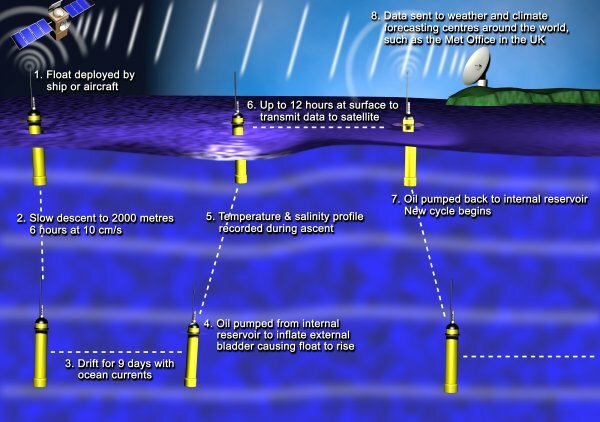 The ARGO float network consists of 3000 autonomous devices, distributed around the world's oceans, that sink down to depths of up to 2000 metres taking measurements of ocean temperature as they ascend up through the water column. The system began to be rolled out in 2000, and by 2003 made up the majority of ocean heat measurements. The full roll-out of the 3000 floats was completed in late 2007. Although ARGO has not been without it's fair share of problems (as with any new technology), it represents a vast improvement over previous methods of sampling subsurface ocean temperature, such as the expendable bathythermographs (XBT's). These are ship-launched devices that unfurl a trailing a copper wire as they descend down into the depths. It's through this wire which temperature information is transmitted back to a data collection system onboard the ship. Unlike the ARGO floats, XBT's don't have pressure sensors to measure depth, instead this is calculated by the rate at which the XBT falls. This calculation is carried out by software embedded in the XBT, and this timestamping of the temperature data is how depth is determined. Unfortunately this method has led to numerous problems in the ocean heat content record. See Abraham (2011). From 1990 to 2002 these XBT's made up the bulk of ocean heat measurements, however because they were sparsely sampled in both time and space, numerous corrections and mapping strategies have had to be employed to remove errors and bias from the data set. 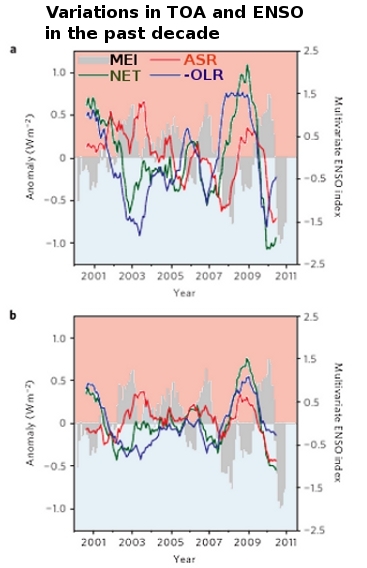 From around 2002-2003, during the transition from XBT to ARGO, global ocean heating seems to decline. See figure 2. 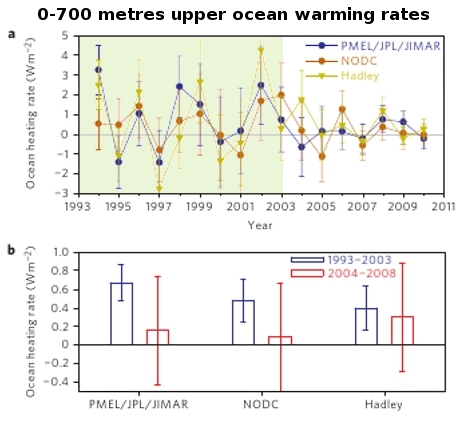 Figure 2- 0–700m upper-ocean warming rates. a, Annual global averaged upper-ocean warming rates computed from ﬁrst differences of the Paciﬁc Marine Environmental Laboratory/Jet Propulsion Laboratory/Joint Institute for Marine and Atmospheric Research (PMEL/JPL/JIMAR) 0–700m OHCA curve using data from Argo and theWorld Ocean Database 2009 the National Oceanic Data Center (NODC) 0–700m OHCA curve, and the Hadley Centre 0–700m OHCA curve. Uncertainties for all annual upper-ocean heating rates are given at one standard error and are derived from OHCA uncertainties. b, Means and uncertainties at the 90% conﬁdence level for 1993–2003 and 2004–2008. Adapted from Loeb (2012). The light green area I've highlighted (in figure 2[a]) is the time period where the XBT were the dominant source of ocean heat content data. During 2003, when ARGO takes over as the major source of data, it's clear that the large year-to-year fluctuations abruptly shrink - an indication that the large variation was not real, but most likely a result of errors in the less accurate XBT-based system. Also notable is the substantial variation in ocean heating rates between the three different ocean heat content data sets. In figure 2(b) are shown the ocean heating rates for the three data sets and their uncertainties. The period where ARGO data makes up the bulk of data (2004-2008 in red) has a greater uncertainty only because their period of observation is much shorter (5 years), versus 11 years for the interval where XBT data predominates (1993-2003 in blue). These uncertainties in ARGO will diminish as the length of the observational record grows, and indeed a decline in the scale of the annual fluctuation seems be occurring even within the 2004-2008 period. "Although the different estimates of OHCA (ocean heat content anomaly) produce seemingly different estimates of interannual ocean heating rate variability, these differences are all within the range of observational uncertainty. The same conclusion is reached when ocean heating rates for 1993-2003 and 2004-2008 are compared (Fig. 2b). The decline after 2004 is therefore not statistically significant 3 , nor does it show up in a previous analysis of the Argo data." As mentioned in the introduction, the satellites which measure incoming and outgoing radiation at the top of Earth's atmosphere (TOA) cannot measure the small planetary energy imbalance brought about by global warming. It is over a hundred times smaller than the energy coming and going from the Earth. But, despite lacking absolute precision, the measuring instruments aboard the satellites are very stable. Therefore the large fluctuations at the top-of-the-atmsophere during ENSO (El Niño/La Niña) present another approach to tracking changes in Earth's energy imbalance. El Niño and La Niña are not only intervals when heat within the system is distributed around the planet, but also periods which see a net loss of heat by the Earth (El Niño) and a net gain of heat (La Niña). Over the long-term these intervals balance out to zero. This net loss/gain of planetary energy during El Niño/La Niña is ishown in figure 3 for the tropics (a) and the global situation (b). Figure 3-Variations in TOA radiation and ENSO during the past decade. a,b, Anomalies in net radiation (NET), absorbed solar radiation (ASR), the negative of outgoing longwave radiation (-OLR), and two-month averages of the Multivariate ENSO Index (MEI) for 30 S–30 N (a) and globally (b). Positive/negative anomalies correspond to a gain/loss of Earth energy. Positive and negative values of MEI correspond to El Niño (red shaded) and La Niña (blue shaded) conditions, respectively. TOA radiation anomalies are determined from monthly averages by removing the seasonal cycle then smoothing with a twelve-month running mean. Adapted from Loeb (2012). In order to compare these satellite-based observations with ocean heat content it is necessary to anchor the data to an absolute scale. Rather than use a model-based estimate, as did Hansen (2005) and Trenberth (2009), the authors achieve this by calculating it from observations of ocean heat content (down to 1800 metres) from the PMEL/JPL/JIMAR data sets over the period July 2005 to June 2010 - a time period dominated by the superior ARGO-based system. By combining the ocean heating rates, TOA observations (figure 4) and other energy storage terms (land, atmosphere warming and ice melt), the authors calculated Earth's energy imbalance from January 2001-December 2010 to be 0.5 (±0.43) W/m2. Figure 4 - Comparison of net TOA ﬂux and upper-ocean heating rates. a, Global annual average (July to June) net TOA ﬂux from CERES observations and 0–700 and 0–1,800m ocean heating rates from PMEL/JPL/JIMAR. Uncertainties for upper-ocean heating rates are given at one standard error derived from OHCA uncertainties. b, Net TOA ﬂux from CERES, ERA-Interim reanalysis and the one standard deviation about the 2001–2010 average of 15 CMIP3 models (grey bar) are anchored to an estimate of Earth’s heating rate for July 2005–June 2010. From Loeb (2012). An obvious feature of the satellite TOA observations (figure 4) is that they do not show a sharp decline between 2002-2005 - the time of the transition from XBT to ARGO. Again this suggests that the scale of the 'slowdown' over that period is simply an artefact of the changeover from one system to the other, and may not be real. While the TOA observations show far less agreement with the NODC and Hadley Centre OHC data sets, after 2004 they demonstrate moderate agreement with PMEL/JPL/JIMAR data sets (as determined by statistical analysis). "Changes in CERES net TOA flux also show remarkable consistency with simulations from the European Centre for Medium-RangeWeather Forecasts (ECMWF) Interim Re-Analysis (ERA-Interim) (Fig. 4b, green line), which are completely independent of CERES." 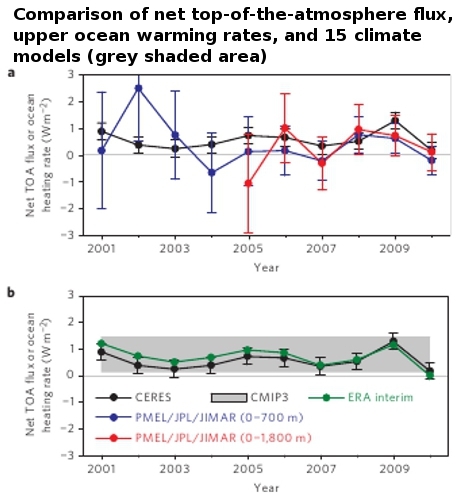 "The rise and fall in CERES and ERA-Interim net radiation and upper-ocean heating rates after 2007 (Figs 2 and 4) is entirely consistent with variability linked to ENSO (Fig. 3) and shows no evidence of a discrepancy between TOA net radiation and energy accumulating in Earth's climate system"
Global warming is the result of a greenhouse gas-caused imbalance between incoming solar energy and heat that the Earth radiates away to space. Heat loss is reduced causing the planet to warm. Previous attempts to estimate this planetary imbalance relied on climate models rather than observations because sufficiently detailed observations were not available then. Loeb (2012) combined ocean heat content data, top-of-the-atmosphere satellite observations, heat absorbed by the land and atmosphere, and the energy required to melt ice. They found the global energy imbalance was 0.5 (±0.43) W/m2, smaller than previous estimates. The uncertainties are large due to the short length of robust observations, and because ARGO only samples down to 2000 metres - less than half the average depth of the global oceans. Although the deep ocean will have absorbed far less heat the the surface ocean it cannot be neglected in order to adequately balance the Earth's energy budget. See: SkS post: Ocean Heat Content And The Importance Of The Deep Ocean. The huge margin of uncertainty and the disparate heating rates between the three ocean heat data sets vindicate Kevin Trenberth's appeal that "we (the scientific community) must do better", but they will improve as the length of the observational record grows, and if proposed deep ocean observations, such as Deep Ninja, are put into place. And perhaps most crucially of all, the persistent energy imbalance at the top-of-the-atmosphere (TOA) is representative of future global warming, or warming "in the pipeline." The Earth will continue to warm until the balance at TOA is restored. The error bars presented in the above post of +-0.43 W/m2 indicate that the climate is virtually in balance or substantially out of balance. Time will tell which it is. Is there an open source to Loeb (2012)? That means a range from 0.07 to 0.93 W/m2, probably in a Gaussian distribution. Which range would you bet on? Maybe 0.00 flat? Or even some negative amount? I have not read any evidence that the range would be flat or negative. Last night I was researching TOA measurements, and came to the conclusion that we do not have the ability to measure these with great confidence. The above post confirms this. If there is no open source for this paper, I will aquire a copy of it to read and absorb for a better understanding of the conclusion. My gut is telling me that the number that seems most reasonable is approx 0.2W/m2. That is based on other papers dealing with issues that are not central to this paper. The L&P effect comes to mind tho. It doesn't really mean either of those because you can't look at the study in a vacuum. To get a naive 'best estimate' of the imbalance would require something like the bayesian interval of Hansen, Trenberth and Loeb. Maybe DM can provide that. In a previous discussion with Tom Curtis on SkS, about confidence level, I was said that 95% is a "conventional" level in statistical significance. But in the abstract (I've not found the paper for free), Loeb et al mention "uncertainties at the 90% confidence level". Is there in the full content of the paper a reason for this choice of 90% rather than 95% or 99% confidence? - I use to see 0-2000 m data for OHC on SkS or on NOAA-NODC website. Is there a reason for choosing the 0-1800 m interval? - the 4a figure is a bit unclear for me. Why is there just a 2005-2010 period for 0-1800m and a 2001-2010 period for 0-700m? Is it unimportant for the calculation of energy imbalance if we do not take account of 700-1800m for half of the period? If I understand it correctly the more heat that goes to the deep ocean the better. It will cause a slight rise in sea levels due to thermal expansion but is unlikely to otherwise affect the surface climate (including the surface layers of the ocean) for many thousands of years. Or have I got it wrong? Camburn@3... Then you would have to come back to basic physics and ask yourself, "How could you possibly increase atmospheric radiative forcing by 2.7W/m2 and NOT get warming?" It seems to me you have to look at the whole package, not just a given part. (the doc is - a59a019.pdf; the article is in Annals of Glaciologym 2011). Both a draft and a final publication are ... somewhere. Sorry, no pdf link. There is already a shortage in the known sources to account for the rise-rate, and absolute sea level, since 1950. If the Loeb analysis reduces the heat imbalance, it increases the insufficient sources of sea-level rise. The picky point with the SKS review is that backlog of 'heat in the pipeline' ... it was just covered, it's being sequestered in the oceans. Opinion - until such time as La Nina's upswelling starts tapping the affected sink, it should have marginal effect on surface temperatures. Instead, it'll be a bumpy ride with continued extremes swings. I think you should say that the XBT system is less precise rather than less accurate. owl905- "The Loeb analysis is a budget solution with a budget problem"
The article makes explicit that the three OHC data sets do not agree. See figure 2. No. The energy imbalance shows that more heat will accumulate in the Earth system until radiative balance is restored. This energy will go into warming the ocean, and atmosphere too. There's no "get-out-of-jail-for-free card" here. "Opinion - until such time as La Nina's upswelling starts tapping the affected sink, it should have marginal effect on surface temperatures"
Yes, well I'd rather rely on the analysis of experts here. As noted in the two part SkS series NASA scientists expect more rapid global warming in the very near future, we are on the cusp of rapid warming, which is likely to take place over the next 3-5 years. Sceptical Wombat @ 7 - " I understand it correctly the more heat that goes to the deep ocean the better"
Yup. Better for us living today. But the effects will be felt at some point in the future. It would also indicate climate sensitivity at the high end of estimates. However some scientists, notably James Hansen, point out that observations of ocean warming are slower than the models predict. In other words, the models mix heat down into the ocean more efficiently than is revealed by real-world observations, yet they do a good job of modeling temperature in the past. This suggests the negative (cooling ) forcing by human-made aerosols (small particles of pollution that reflect sunlight), which have to be specified in the model runs because they cannot be modeled, may in fact be much larger than commonly thought. If true this is very bad, there may be much more warming unmasked when atmospheric pollution declines. Very interesting to see figures based on observations agree with the theory and the models in that there is an imbalance between incoming and outgoing energy, even if the magnitude may be less than models predicted. Even so, the margin for error in the observations include the modelled ranges. Should I read the 0.5(±0.43) W/m2 as meaning the .05 is most likely, or does the distribution of possibilities favour a higher or lower figure as most probable? It is probably a dumb question, but I am not a statistician and I have seen discussions where the mid-point of a range is not always statistically the most likely. Generally when an estimate is expressed as x(+/-y) the distribution is considered approximately normal. For normal distributions, numbers closer to the mean(x) are more likely and mean + y (in this case 0.93W/m2) is ~as likely as mean - y (0.07W/m2). However, because the physical models (Hansen, Trenberth) indicate that the energy imbalance is most likely to be around 0.9W/m2, the body of science suggests that the actual imbalance is more likely to be in the upper region of Loeb's estimate. Camburn@3: An energy imbalance of only 0.2W/m2 is a very alarming conclusion. That would mean that even more GHG warming is being masked by other effects (given that the forcing due to GHG is confirmed by OLR satelite observations, and the CO2 forcing is accepted even by Spencer, Lindzen, Monckton and company). If the masking is due to aersols (which we would then have to keep generating at current rates to maintain the cooling) or anything cyclic (which can thus swing back again), then we're totally screwed. Hopefully you are wrong and the imbalance is rather higher. Does GRACE shed light on total OHC? If we know how much more water there is in the 'ponds' courtesy of GRACE's gravity profiles, subtracting sea level rise due to the added water should leave sea level rise due to pure thermal expansion. Even if the coefft of thermal expansion changes with pressure & temperature, the rough amount of heat ending up below 2000m should be calculable to some extent, wouldn't it? I'd like to point out that the last ten years have demonstrated an unusual number of strong La Niña events. Even a casual glance at the MEI shows this. So the imbalance measured for the last decade will be low (compared to a longer average) simply because of the way the winds have tended to blow in the Pacific for the past ten years. That is not going to continue forever. It is going to even out over time. This implies that for every ten years of 0.5 (±0.43) W/m2 that we see, there will probably also be another ten years of, say, 1.5 (±0.43) W/m2 (or whatever). Once again, we are simply dealing with too short a time frame to view an accurate trend. "In two sets of experiments, Clement, recent UM alumnus Pedro DiNezio, and co-author Clara Deser from the National Center for Atmospheric Research modeled two climate scenarios – one with a static, current-free ocean and another with a fully dynamic ocean. The team showed that atmospheric pressure, surface temperature, and precipitation were the same in both ocean scenarios, which reveals that the Southern Oscillations global signature is still present even when the ocean and atmosphere are disconnected." I am not convinced that ENSO is not a climate driver. Clements research raises some thoughts. The imbalance of radiation found as lower in this paper is using measured states of radiation. The measurements show that Trenbeth and Hansen were close in their models, which is a very fine outcome. As far as another 10 years of 1.5(+-.43)W/m2, that is speculation, your opinion. All factors must be taken into consideration. A SSW can expel tremendous amounts of heat and is a random event. Some years there is one, some years there isn't. I posted Clement eta 2011 and now on reading my post it looks like I was discussing this paper, when in fact I am discussing the paper presented in the above article. I am not convinced that ENSO is not a climate driver. Please provide any reference whatsoever to any even remotely viable mechanism whereby ENSO can be a "climate driver." Actually, on second thought, I may have that backwards. A preponderance of La Niña events should result in a greater imbalance (less OLR)... unless the cumulative, global, radiative effects of ENSO events are counter-intuitive (i.e. colder surface/atmosphere does not mean less radiated energy). #17 Sphaerica : "Once again, we are simply dealing with too short a time frame to view an accurate trend"
That's unclear. Taking account of (nearly) all the heat content in the climate system is supposed to avoid the bias of short term surface temperatures. The question precisely adressed here is the current energy imbalance in the system, not what it will be in the future nor what it was in the past. If Loeb et al central estimate was correct, then Giss Model central estimate would be uncorrect, but for different possible reasons (for example, underestimation of aerosols, overestimation of fast / transitory feedbacks, etc.). But IMO this kind of work is still too imprecise to draw conclusion, the 95-99% confidence interval for Loeb et al would be even more large. So we're still in the "travesty" denounced by Trenberth, we know exactly what we would like to quantify very precisely, but we've not the instruments enough precise for this task. "We combine satellite data with ocean measurements to depths of 1,800 m, and show that between January 2001 and December 2010, Earth has been steadily accumulating energy at a rate of 0.50 +/- 0.43 Wm-2 (uncertainties at the 90% confidence level). We conclude that energy storage is continuing to increase in the sub-surface ocean." "Most curiously, the authors choose the “90% confidence interval” instead of the usual 95%. Why? Skip the discussion of the meaninglessness of confidence intervals and interpret this interval in its Bayesian sense. Then this means that the coefficient of the regression associated with time is estimated at 0.5 W-2 with a 90% chance of being anywhere in the interval 0.07 to 0.93 Wm-2. This is an unobservable coefficient in a model, mind. It is not an amount of “energy.” To get to the actual energy, we’d have to integrate out the uncertainty we have in the coefficients." Loeb et al's paper is quite new so we'll see how it holds up. I think one should note that the error bars given applies only to this work. If you do a meta-analysis of more papers on the subject, you get different combined error bars. Interestingly, Trenberth has given some critical comments of the paper as referred by science journalist David Appell. I think you should be more clear about what you mean about "warming in the pipeline". If you are talking about surface warming, there is a serious problem in the central argument presented here. I think you are confused by the difference between a "constant composition" atmosphere (which has warming in the pipeline), and the case of warming based on past emissions (for which there is no warming in the pipeline). This is common mistaken even among climate scientists. We are NOT committed to any surface warming from past emissions. As a thought (or climate modelling) experiment, imagine emissions went to zero tomorrow - would the world keep on warming? The answer is no. The ocean would absorb CO2 out the atmosphere, drawing down the radiative forcing over time. The heat from the radiative forcing of the 'excess' CO2 still in the atmosphere is also almost completely absorbed by the ocean. Thus no further surface warming occurs. Of course the (deep) ocean does warm and expand. That is not the case. As long as there is an energy imbalance at the TOA, as long as the oceans in particular are in thermal disequilibrium, there is "warming in the pipeline", or as I prefer to term it, unrealized warming. This is only made worse by the increasing greenhouse gas forcings we are putting out. To quote Galileo, ""Eppur si muove. When the energy content of the climate stops moving, attains long term averaged equilibrium at the top of the atmosphere, then we can state that there is no longer "warming in the pipeline". If we were to stop emissions tomorrow, there will still be decades of warming before the TOA imbalance is addressed - simply due to thermal inertia. From the original post (just above first graphic): "It puts paid to wishful thinking-based claims that global warming has halted." - what does "It puts paid" mean? I am not familiar with this turn of phrase. Sphaerica @ 22 - when I first read your post at 17 I thought what you did at 22 - that La Nina would be the worst case (ie .5C +/-.43 is the most we will see, not the least). However, while this paper is based on the ARGO network, the authors also included land and atmosphere - so they are really stating that the .5C is where we are at and it is La Nina/El Nino independent. I presume that number will get revised up as the balance of evidence suggests a higher number. Am I missing something in reading it in this manner? Let me try an analogy on the 'in the pipeline' argument to see if it helps. I own a swimming pool centre with 2 pools, a toddlers wading pool and an olympic size swiming pool. They are connected by a pipe so at equilibrium they hve the same surface level. I have a float valve in the toddlers pool that lets extra water in if the level is low. Then I decide to raise the overall level of the pool. So I adjust the setting of the float valve so that it will aim for a higher level. So water starts flowing into the toddlers pool and its level starts to rise. As this happens the emerging difference in height between the two pools starts a flow into the olympic pool. Eventually the flow into the toddlers pool will match the flow into large pool and the toddlers pools stops rising while it waits for the olympic pool to fill. The olympic pool is the oceans. The toddlers pool is the surface - land, sea surface, air, ice, they components that contribute to determining radiative balance with space. And the level setting of the float valve is the GH gases. So if we have made a one off adjustment to the valve ( a step change in GH gas levels ) then eventually levels in both pools will stabilise and the valve will shut off - no more imbalance. However what we are actually doing is slowly but ointinually adjusting the valve higher and higher. So the water flow through the valve is steadily increasing. Thus the Toddlers pool is able to keep rising somewhat even though it is being retarded by flow into the Olympic pool. So your example of stopping all emissions is the equivalent of stopping adjusting the valve higher. But the filling of the pools still needs time catch up with the setting the valve is finally at before the water flow eventually stops. The real world situation would obviously be more complex enough but in essence the world must keep warming until surface temperatures rise high enough to cancel out the energy imbalance. And that can't happen until the oceans stop drawing down heat and limiting the surface warming. Tristan @ 14, thank you for the clear explanation. I grasp the concept better now. The current TOA imbalance is that which the planet has yet to respond to. Most of the greenhouse gas forcing has already been used up in raising sea levels, warming the oceans and atmosphere, and melting ice over the last two centuries. The remaining imbalance is 'warming in the pipeline', i.e. further warming will rectify this imbalance, but of course, we keep adding more greenhouse gases to the atmosphere - so it can't come into balance. I hope you can follow the distinction here - not all forcing from historic greenhouse gases have been used up. The slow response is due to the thermal inertia of the oceans. "But don't believe me, look at the Damon and Weaver paper clarifying this misconception"
I can't find a copy of the paper, but it was discussed over at Real Climate by climate modeler Gavin Schmidt back in 2010. It seems to be discussing something completely different from what you infer. I don't know how useful it is to consider an imaginary scenario where CO2 emissions suddenly drop to zero, but man-made aerosols (reflective particles of pollution that cool the Earth) don't. Sort of like arguing how many angels can fit on the head of a pin. The recent GRACE paper suggests a slightly lower contribution of land-based ice melt to sea level rise, which, if confirmed ,indicates greater thermal expansion than previously supposed. There's much work yet to be done on this, I wouldn't hang my hat on it. skept.fr - here's a free copy of Loeb (2012). The article is available at the link I provided above, with the title: Committed climate warming. The article discusses exactly the point I made (Quote below). There is great value to this thought experiment. If there is a large committed warming from past emissions, it implies future warming is inevitable. However, for GHG forcing, this is not the case. (Lets leave aerosols aside for now and just think about carbon, there might be a case to made for aerosols). 1) stop emissions [so as to consider an ideal case of 'committed warming from past emissions']. 2) CO2 is sucked up by the ocean, reducing the TOA imbalance over time. In the meantime any remaining TOA imbalance causes warming. However the ocean is absorbing, not releasing heat. The amount of heat uptake by the deep ocean almost exactly balances the warming due to the remaining (but disappearing) TOA imbalance. Thus the surface does not warm any further; rather surface temperatures remain constant for hunders to thousands of years. As I said before, of course as long as there is a TOA imbalance the climate system as a whole will warm, but this occurs in the deep ocean, not at the surface. Please recognize that this is a key concept behind why the "cumulative carbon emissions" methodologies work. If you can, I encourage you to read the peer-review papers which discuss these concepts at some length. Damon Mathews is an author of several. In addition to the "committed warming" paper, see also the 2009 Nature paper "The proportionality of global warming to cumulative carbon emissions"
" We argue that the notion of unavoidable warming owing to inertia in the climate system is based on an incorrect interpretation of climate science. Stable atmospheric concentrations of greenhouse gases would lead to continued warming, but if carbon dioxide emissions could be eliminated entirely, temperatures would quickly stabilize or even decrease over time. " PS: Please note, my outlines above are not some wacky opinion that I've concocted. They are the results of performing these experiments with state-of-the-art earth system models, as you will find in the literature I referred to. neil - Please note that your scenarios assume that CO2 emissions cease. Do you actually expect that to happen? An interesting Gedankenexperiment - but really, not realistic. Given the ~40-50% of emissions absorbed by the oceans per year (~2+ppm), there would be a half-life of ~40 years on the over equilibrium CO2 for just the simplest absorption case. If you look at current literature (such as Archer et al 2009), which show that CO2 drawdown is a combination of several processes, some with geological extent, it's actually tens of thousands of years for the last 25-30% of CO2 to be absorbed. During which time the "warming in the pipeline" will occur. You present a rather rosy view. I think the science, the literature, do not support that. Neil - As I stated earlier, I can't locate a full copy of the Matthews & Weaver paper, so have to rely on commentary at Real Climate. The imaginary scenario proposed by the authors is utterly pointless in my opinion. Greenhouse gas emissions will not drop to zero, and one has to include the effects of aerosols dropping out of the atmosphere if one wants to realize committed climate. Aerosols will drop out of the atmosphere within weeks in such a scenario leading to abrupt warming, whereas draw-down will take some time - assuming the terrestrial carbon sinks behave as anticipated. "Please note, my outlines above are not some wacky opinion that I've concocted. They are the results of performing these experiments with state-of-the-art earth system models, as you will find in the literature I referred to. Actually there have been a few peer-reviewed papers surfacing lately about the summer Arctic sea ice loss not being irreversible - if the Earth undergoes sufficient cooling. That seems an extraordinarily unlikely scenario too. Obviously someone considered it was worthwhile wasting supercomputer time. 33 Rob : thank you! This quantity is basically the amount of energy received from space (Sun) that have not been reemitted to space (outgoing thermal radiation), and that have in consequence heated the system (mainly the ocean) or melt the ice. I would say this is equivalent to the integral of all forcings (natural+anthropogenic) on the period plus an hypothetic short term variability in cloud cover (for example, if for any reason there is more/less cloud-cover at the end of the period compared to the beginning, this would create the equivalent of a forcing in the short period analyzed, because more/less entering short wave is reflected to space). The "pipe-line" means in my mind that as far as forcing have not changed substantially, the process continue permanently (and the more we add radiative agents in the atmosphere, the higher the imbalance). It may also means that part of the heat content accumulated in the ocean 2001-2010 will be transferred to the surface, either in a fast (year-to-decade) warming rate for surface layers (ENSO-like variability) either in a slow warming rate for the deeper layers of the system (century-scaled THC). Is it the way you understand these data? A 3.7W/M2 is supposed to be the total energy added by CO2 to the earth system according to numerous estimates over 150 years. An additional 3.7W/M2 would cause a 0.6C increase in temperature at the surface according to theory. We have increased co2 by 30% of what we will to double it and we should get approx 50% of all the heating we will get from a doubling of co2 concentration by this 30% increase due to the decreasing logarithmic effect of adding co2. This means we should be seeing a 1.9W/M2 imbalance not 0.5. Even if we take one guassian deviation we end up with 0.9W/M2 which is still half the theoretical additional heat from co2 alone. We are told that feedbacks will add an additional 7 or 10W/M2 to get to 2 or 3 degrees by 2100. However,at only 0.5W/M2 or even 0.9W/M2 the total heat rise from a doubling of Co2 would be less than the 0.6C expected because we seem to have an attenuating feedback that has reduced the energy imbalance from what should be 1.9W/M2 to 1/4 of that implying possibly 0.2C temperature rise from a doubling of CO2 not 2C. #40 Rob : I agree with your points about the interannual variability of total forcing and, of course, the possibility of a decreasing (less positive) imbalance because of fossil depletion, either by natural constraint or by political choice. On the very same thematic, I think you should discuss on SkS the last Douglass and Knox paper . There are for me some interrogations: Why did they choose 0-700 m rather than 0-2000m? What is the importance of XBT / MBT / OSD / CDT instruments in the Levitus 2010 base they used? To which extent their "climate shifts" is nothing but the natural variability for very short term energy balance? Etc. @ KR 37 , Yes emissions stop, that is the point. I obviously do not expect that to happen in reality, its a thought experiment used to explain a concept, as is widely employed in science. You are right that the carbon takes thousands of years to be removed from the atmosphere, which the ocean does very slowly. 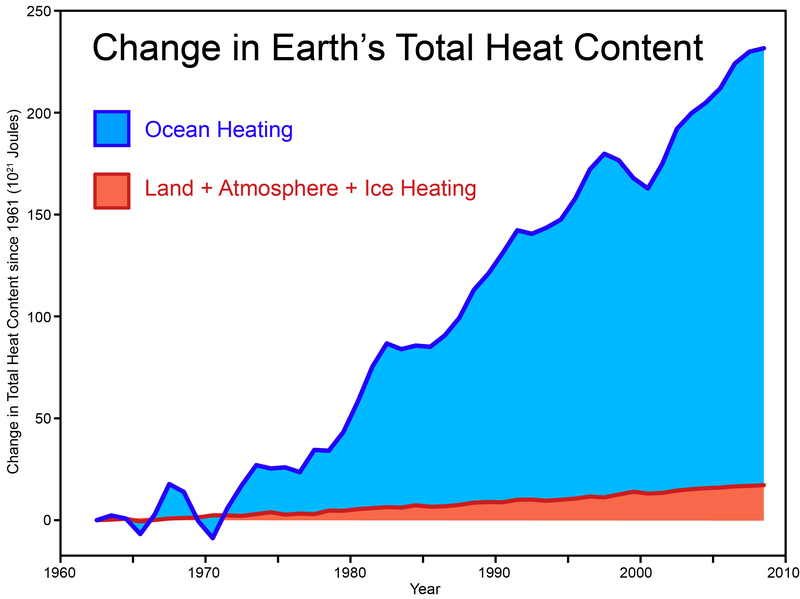 The point that you are missing though, is that at the same time, the ocean is ALSO taking up heat [NOT releasing heat]. For this reason, surface temperatures remain roughly constant (on the 100-1000 year scale), but the deep ocean warms. Ok. The paper describes a thought experiment - a clean way of isolating warming from "past emissions". This applies to reality too, and its very important for policy, because if as you say a significant amount of future warming will occur from past emissions, then it might well seem that the case is "lost" already. From Mathews and Weaver: "The perception that future climate warming is inevitable stands at the centre of current climate-policy discussions." [Note we are talking about greenhouse warming, to me your article implied that future warming will result as a consequence of something to do with ocean heat storage, which is why I brought this up.]. I don't think Damon Mathews would have three Nature papers on this if it was "utterly pointless", so please lets just take stock here in a respectful and polite manner. my arguments above, well supported by the peer-reviewed literature, on the basis that there is nonsense in the literature and "someone considered it was worthwhile wasting supercomputer time.". As far as I understand, skepticalscience is about having reasonable, discussions based on the peer-reviewed science. To me, your comments seems to contradict this in spirit and letter. I fully agree that you have a point based on aerosols. But "heating in the pipeline" based on ocean heat is simply scientifically incorrect, and this has been demonstrated. If you need the paper, I'm happy to email it to you. @skept.fr 38 : This is is all consistent. If emissions "stop" the surface does not warm, but the ocean continues to warm. neil - "The point that you are missing though, is that at the same time, the ocean is ALSO taking up heat [NOT releasing heat]. For this reason, surface temperatures remain roughly constant (on the 100-1000 year scale), but the deep ocean warms." The whole thing about "warming in the pipeline", or unrealized warming, is that the climate has a response time to forcing changes. Looking at ice core evidence, it takes at least 500-800 years (based upon CO2 delay) to come to equilibrium with such a forcing change. And during that time, as feedbacks kick in, warming (including surface) continues until that equilibrium is reached. The oceans will not prevent surface warming in the meantime. Variability such as ENSO may cause short term (decadal) lows and highs in the rate of temperature rise, but those are variations superimposed on the climate response. In the case of our anthropogenic forcing the climate is only partway through the transient response (roughly a few decades long), let alone the equilibrium response. The climate is still responding to forcing changes from decades ago. If we were to stop emissions in toto tomorrow, we can expect temperatures to continue to rise until that imbalance is canceled out, and the climate once again reaches (averaged) equilibrium. This does not, mind you, even consider the effects of emitted aerosols, which currently provide a significant negative feedback. Those have a fairly short lifetime (months? ), and ceasing aerosol emission would immediately increase the TOA imbalance. Best scenario under halting all emissions? Temperatures continue to rise, quite sharply at first as aerosols fade. Then in 50-150 years (sorry, haven't run the math to be more exact) the imbalance should zero and start to reverse (transient response going up, against forcings due to oceanic absorption going down), temperatures will begin to decline, followed by a few hundred years of drawdown, followed by about 20-40% of anthropogenic CO2 that can only be drawn down over near-geologic timeframes. This "warming in the pipeline" is not a problem that can be solved like turning off a switch - the climate has immense inertia, and we've been pushing it for quite some time. Neil - sorry but I don't have the same reverence you have toward the scientific literature, there is plenty of junk in there too - check out Roy Spencer and Richard Lindzen's work for instance. "Turning now to the case in which all anthropogenic emissions cease, there is an immediate unmasking of greenhouse gas forcing as aerosols are quickly washed from the atmosphere. The effect is an abrupt rise in climate forcing (Figure 1a) to a peak value of around 2.7 W m−2 , which is relatively well constrained as it depends only on greenhouse gases. The response is a rapid warming (Figure 1b), with a transient commitment of up to 0.9°C above the modern temperature. Thereafter, forcing declines over the next few centuries as greenhouse gases are partially, but not completely, removed from the atmosphere"
Neil -"This is is all consistent. If emissions "stop" the surface does not warm, but the ocean continues to warm"
That makes no sense at all. How can the ocean warm without eventually exchanging that heat to the atmosphere? #42 neil : ocean transfers heat to the atmosphere by three way : latent heat of evaporation (~78W/m2), radiation (~66W/m2) and conduction (~24W/m2). Orders of magnitude here. The latent heat for evaporation is mainly extract from the liquid state (the ocean surface layer). On average, oceans skin and subsurface layer are a bit warmer than the air (1-2 °C, same source). So, in the hypothesis of a "stop" forcing, I guess oceans would still release one part of the excess heat accumulated during the forcing period (the other part being transferred to deep layers), and they would do so by evaporation, radiation or conduction. What I ignore is the relaxation time for this exchange ocean-air persisting after the forcing had stopped. It probably depends on how the upper layer of ocean is stratified (or, to the contrary, mixed with sub-layers by turbulent exchange). That is the way I figure the proximate mechanisms of "pipeline" as long as ocean alone is concerned. But there are other mechanisms too. For example, if the forcing period had reduced the sea ice extent and thickness, when the forcing stops, sea ice is more prone to melt (less thick) and to absorb subsequently the incoming solar radiation. This loss of albedo /accumulation of heat would last even after the forcing has ceased, it is caused by the fact that the system before and after the forcing is no more the same. skept.fr - we'll have a post on Douglas & Knox (2012). It's a hard read, that's for sure. And there are some rather obvious problems - such as including the geothermal constant in their calculations. Painting wrote: "Because this planetary heat imbalance is tiny compared to the energy coming in from the sun, and the heat being radiated back out to space, it is too small to be measured directly by satellites." But I found this claim elsewhere on SkS: "In 1970, NASA launched the IRIS satellite measuring infrared spectra. In 1996, the Japanese Space Agency launched the IMG satellite which recorded similar observations. Both sets of data were compared to discern any changes in outgoing radiation over the 26 year period (Harries 2001). What they found was a drop in outgoing radiation at the wavelength bands that greenhouse gases such as CO2 and methane (CH4) absorb energy. The change in outgoing radiation was consistent with theoretical expectations. Thus the paper found "direct experimental evidence for a significant increase in the Earth's greenhouse effect". This result has been confirmed by subsequent papers using data from later satellites (Griggs 2004, Chen 2007)." Can someone help me reconcile these statements? Total top of atmosphere (TOA) global imbalance is usually inferred from the various components, as there aren't any satellite resources doing direct differencing between incoming and outgoing radiation (quite difficult to do, given in particular spatial variations). Spectral changes in Earth emission, on the other hand, are very easy to measure. Over time, the relative energy in the Earth emission spectra, as per Harries 2001 and others, has shown decreases relative to the rest of the spectra at just the wavelengths expected for increased GHG absorption. That can be measured as changes on a single instrument, as the spectra will differ. Also, that can be observed at any point on the planet as a consistent local measure. It's really the difference between relative values on either the same or similar instruments, versus global sums. Ok, I'm going to try one more time, then I'm out. Like I've said, you have a point about aerosols, but you are wrong on carbon-induced warming. I think I can identify the source of confusion. There is a difference between "past emissions" and a "constant composition atmosphere". The fully-coupled models used for IPCC AR4 were only 'physical' models. They did not contain carbon-cycles, so carbon could not be advected around or exchanged between natural reservoirs. Instead, atmospheric CO2 concentrations are specified in this class of models. Common scenario's included an instant doubling of CO2, or a 1% increase in CO2 per year. Ok, now lets consider what happening is these model results, which we are familiar with. In the scenario where CO2 is increased, and lets say set to 450 ppm - the surface temperature takes hundreds, or thousands of years to come into equilibrium (this here is your "warming in the pipeline"). Even if CO2 is increased slowly at say 1% per year, rather than instantly, it takes hundreds of years for equilibrium to be reached (because of the slow-adjustment of the ocean some people here have talked about). However, the key to realize is that in order to maintain an atmospheric CO2 of 450 ppm, you need a constant source of emissions. If there were no emissions, the ocean would take up carbon, and the atmospheric CO2 would drop below 450 ppm. However the AR4 models could not diagnose what emissions were consistent with keeping CO2 at 450 ppm, since they did not contain carbon cycles. The set of intermediate complexity earth system models (such as UVic, Bern, Climber) do contain carbon cycles, and could diagnose the emissions consistent with keeping CO2 at 450 ppm. Also, the new generation of fully coupled models being used currently in CMIP5 / AR5 are earth system models (or carbon-climate models), that are capable of tracking carbon through the system. So, for a constant composition atmosphere, surface temperatures take hundreds of year to come into equilibrium (but, keeping CO2 constant also requires some ongoing emissions). For zero emissions, (or the commitment to past emissions), there is no future warming, as explained previously. @Rob 45 That makes no sense at all. How can the ocean warm without eventually exchanging that heat to the atmosphere? Don't get confused between heat and temperature!! The ocean can absorb a massive amount of heat, but the average temperature of the ocean (and particulalrly the deep ocean) will remain below the temperature of the surface! Thus the direction of the heat flux remains downward!